ITSENCLOSURES has unveiled the new viewstation, a large format display enclosure. Viewstation is an enclosure designed specifically to protect standard size, large format plasma or LCD displays. With the viewstation, LCD and plasma displays are protected indoors or outdoors at airports, hotels, stadiums, arenas, shopping malls, universities, and convention centers. The viewstation will extend the display's useful life and shield your message by protecting against theft, vandalism, display damage, and the elements. The viewstation, available in popular sizes to protect monitors, offers three secure mounting options: pole, wall, or ceiling-mount solutions. Viewstation is sealed, lockable, and secure. 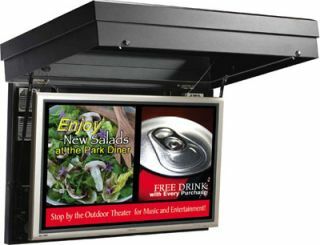 The large format display enclosure comes in black and stainless steel, and also is equipped with a filter fan system that helps keep the monitor cool and dust free and an infrared sensor that allows for simple and remote I/R distribution control. Other features include a gas strut assisted door, a spring hinge door removal, and sealed splint panel cable ingress and egress. Easily installed by two people, the viewstation can be maintained by just one person.